Discover Strategies for Getting Things Done! Are you tired of ending a day at work, only to see how many things are still left undone? Does facing a weekend or even a vacation cause you to feel stressed and discouraged, rather than looking forward to fun and relaxation? Perhaps you are getting so little accomplished on the job that you may be thinking of quitting and moving onto something different. On the other hand, perhaps you have decided that all you really need are some good strategies-- some positive techniques to help you to get more done. No matter what kind of job you have, whether you are just beginning or have an advanced role in your career, it is easy to get on the wrong track. All it takes is spending a little time there, and you may start to feel as if you will never move forward. While you know that quitting is not the answer, you may not be sure what kind of step to take next to begin advancing in the right direction. If you think about it there are actually three ways to go about doing your job. You may accomplish very little, and be extremely dissatisfied. You may do what you believe you need to do, yet still not feel completely satisfied with the results. Or you can get motivated, become much more productive, and take pride in all that you accomplish. The good news is that you do not have to “go with the flow”-- you can choose between poor results and results which you can truly be satisfied with-- and you, yourself, can make it happen. You now have the opportunity to get all of the information you need! This is definitely the ebook you have been waiting for! This ebook is written clearly, in easy-to-understand terms, to make every concept ready for you to put into practice in your everyday work life! It does not matter how long you have been working at your current job. It doesn’t matter whether you are an executive, a team player, or whether you work on your own. Each of these strategies for getting things done will work for your job-- and they will work for you! Perhaps you occasionally encounter a problem which you are not sure how to solve. Perhaps your work life is filled with stress, burdens, and other negativity which may even make you wonder whether or not it is worth it. You want to get on the right track, and start to be more productive. You want to get more done, and be delighted with the results. You do not need to continue wasting valuable time in your work day with trial-and-error. In a very short period of time, you can learn how to develop positive strategies to make every hour of your work day count. These strategies are not merely vague ideas for you to read about and then forget-- they are practical tips which you can apply each and every day. Not only will you get more done, but your work days will be smoother, easier, and more satisfying. Your work life can begin improving almost immediately-- but only if you buy this ebook today! Instead of wasting another year, or even another day, being discouraged over how little you are accomplishing, you can buy this book today, and start learning new strategies today! You will not be able to find this ebook in any stores! It is not available anywhere other than here! Right now is the best time to take advantage of this opportunity to learn all you need to know about becoming more productive! This guide is not marketed towards the rich or the poor, it is marketed for anyone who wants to be able to better understand Anxiety & Panic Attacks. 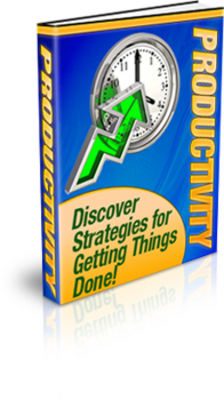 Productivity - Discover Strategies for Getting Things Done getting things done;productivity 93891688 9.95 valuebooks Fresh Download Available!